See what the global tobacco giant is doing and what challenges it faces. International exposure can give investors valuable diversification, and even though Philip Morris International (NYSE:PM) is technically headquartered in New York City, the tobacco giant concentrates entirely on its global territory outside the U.S. market. The company has only been independent since 2008, but already it has put together an impressive history. Below, you'll see three charts that show Philip Morris International's story thus far and what challenges it is facing right now. Philip Morris International has performed extremely well for shareholders in its brief history, with fundamental strength helping to drive solid returns. As you can see in the chart below, when you look just at the change in the Philip Morris stock price by itself, you can't help but notice the appreciation in value that Philip Morris shares have enjoyed over that timeframe. 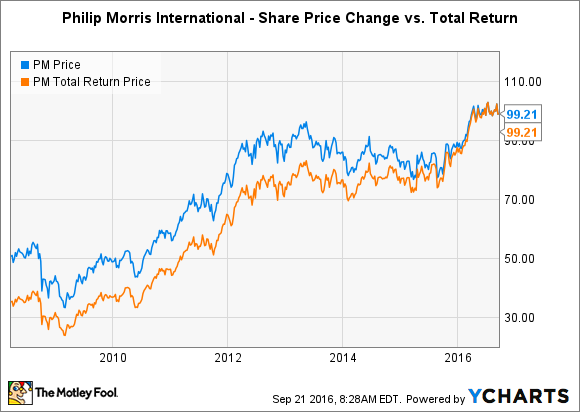 Yet even in the span of less than a decade, it's equally clear that the dividends that Philip Morris has paid have played a vital role in contributing to the company's total return. In particular, the line above marked "total return price" incorporates the dividends that Philip Morris has paid into its past performance. As you can see, the two lines end up in the same place, but the much lower path for the total return price line indicates that the overall gains when you include dividends are much higher than when you look at share price alone. 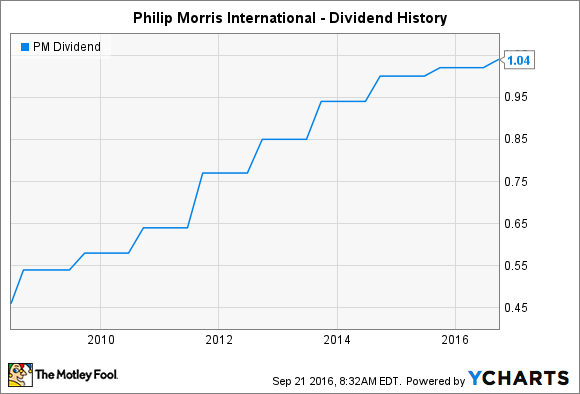 Looking more closely at the dividend picture, Philip Morris has paid high yields and offered dividend growth to its shareholders throughout its years as a separate publicly traded company. The tobacco company recently made its ninth consecutive annual dividend increase, sustaining a streak that dates back to its first year after its initial public offering. PM Dividend data by YCharts. Yet as strong as the gains in Philip Morris' dividend have been, the chart above clearly shows that dividend growth has slowed in recent years. After making several double-digit percentage increases in its early years, Philip Morris has made only 2% increases to its dividend in 2015 and 2016. That has some investors worried about the long-term trajectory of the company's total return of capital to shareholders, especially since it comes at the same time that Philip Morris has suspended what used to be substantial stock repurchases. The main problem that Philip Morris has faced recently is the strength of the U.S. dollar. Because Philip Morris gets its revenue in foreign currency, a strong dollar means that its sales and profits translate into weaker results when reported in dollar terms. Below, you can see just how strong the dollar has been since the beginning of 2014. 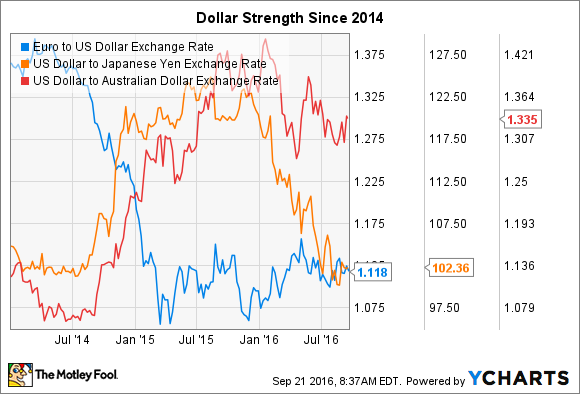 The falling blue line indicates the drop in the euro compared to the U.S. dollar, while the rising orange and red lines indicate the dollar's strength against the Japanese yen and the Australian dollar. More recently, investors have been hopeful that some of the currency headwinds that Philip Morris has faced might be dissipating. The euro hasn't really done much to recover over the past year, but as you can see, the Japanese yen has regained almost all of the ground it lost to the dollar in 2014 and 2015. Already, Philip Morris has said that the negative impact from foreign currency weakness has started to decline in year-over-year terms. If the U.S. dollar actually weakens at some point in the future, then Philip Morris could enjoy corresponding benefits, boosting earnings even further than whatever fundamental growth in its underlying business Philip Morris can generate. Philip Morris International has done well in providing strong returns for shareholders even in the face of currency challenges. With continued vigilance, Philip Morris should have an opportunity to keep giving investors the results they want for the rest of its first decade as an independent entity and beyond.